A Stateflow® flow chart is a graphical construct that models logic patterns such as decision trees and iterative loops. Flow charts represent combinatorial logic in which one result does not depend on prior results. You build flow charts by combining connective junctions and transitions without using any states. 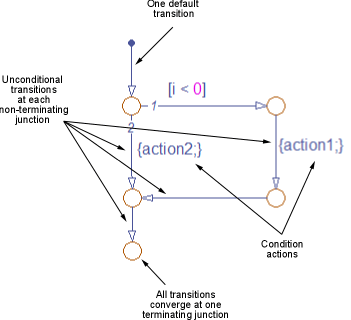 The junctions provide decision branches between different transition paths. Executing a flow chart begins at a default transition and ends at a terminating junction (a junction that has no valid outgoing transitions). A best practice is to encapsulate flow charts in graphical functions to create modular and reusable logic that you can call anywhere in a chart. For more information about graphical functions, see Reuse Logic Patterns by Defining Graphical Functions. Add transition paths between junctions. Add a default transition to the junction where the flow chart execution starts. Flows charts have a single entry point. Multiple terminating junctions reduce readability of a flow chart. Execution of a flow chart always reaches the termination point. If unintended backtracking occurs during simulation, a warning message appears. You can control the level of diagnostic action for unintended backtracking in the Diagnostics > Stateflow pane of the Model Configuration Parameters dialog box. For more information, see the documentation for the Unexpected backtracking (Simulink) diagnostic. 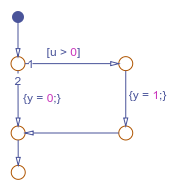 The junction does not have an unconditional transition path to a state or terminating junction. Multiple transition paths lead to that junction. Flow charts test transitions, but do not execute them (and, therefore, never execute transition actions).